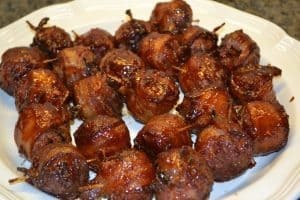 Italian Meatballs Wrapped in Bacon. How can you go wrong with that? I think I’m having Kansas State Fair withdrawal. I know I have been talking about the fair a lot latel,y and I promise this will be the last time, at least for a little while. My family and I partook in all the usual fair foods last week. We had Pronto Pups, beer battered cheese curds, burgers at the Beer Garden, bloomin’ onions, Tacones, Kriebel’s brats, and a red velvet funnel cake. The one thing I wanted to try, the thing I heard more people talking about, was the “Moink Balls,” but every time we went by the stand the line was too long. 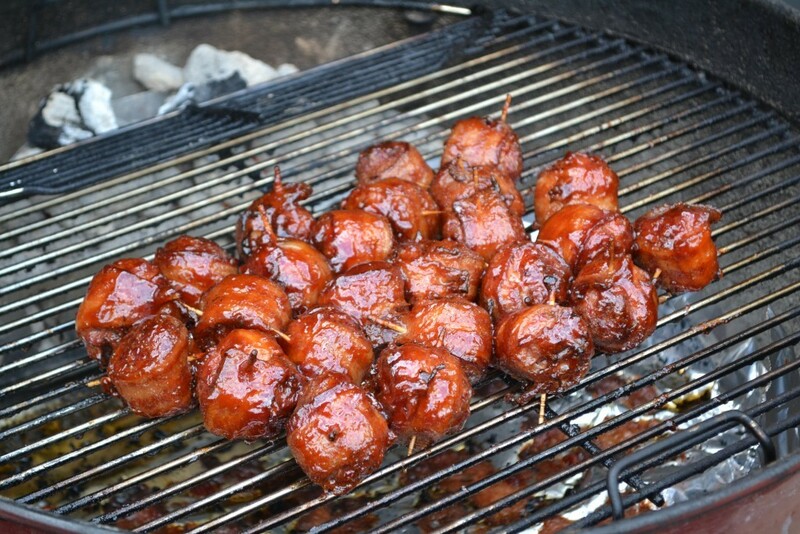 Moink Balls are an Italian Meatball wrapped in Bacon and smoked, “moo” for the beef and “oink” for the bacon, clever huh? On Saturday, the last day we were there, the kids and I got in line because I knew it was my last chance. It was long and wasn’t moving at all, so we moved on and I didn’t get Moink Balls. That’s why I’m including this disclaimer: I don’t know if these taste anything like the Moink Balls at the Fair, maybe someone who had some can let me know. We thought these were great! An online search produced a video from the Today show of two guys with a grilling cookbook called BBQ Makes Everything Better. They were making a basket weave of bacon to encase some sausage that they were going to grill. They then went on to discuss their Moink Balls. I knew I liked these guys. I will probably have to get their cookbook. My recipe is adapted from theirs. They said to use Italian Meatballs. I don’t know if the cookbook has a recipe for meatballs from scratch, but I used mine. I also used my quick and easy BBQ sauce. Their recipe said to use BBQ sauce and mix it with grape jelly. My sauce is pretty sweet so I just used that. You want a sweet sauce so that it caramelizes onto the bacon. Okay, enough rambling–here is the recipe. 25 toothpicks, soaked in water for 20-30 minutes. 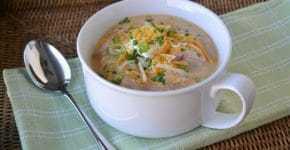 Place eggs in a large bowl and beat slightly. Mix with Italian bread crumbs and ground beef. In a small bowl mix the rest of the ingredients and add to the ground beef mixture. Mix well, but don't overwork. Form the mixture into meatballs. I use a 1 ounce cookie scoop so mine are uniform. It is about 2 tablespoons meat per meatball. We got 25 meatballs from our mixture. Combine all the ingredients in a medium saucepan. Bring the mixture to boiling, reduce the heat and let simmer, uncovered, for 10 minutes. Makes about 1½ cups sauce. Wrap the half strip of bacon around each meatball and secure with a toothpick. Combine the brown sugar and cayenne pepper in a small bowl. Sprinkle mixture on the outside of the bacon wrapped meatballs. Smoke the Moink Balls over indirect heat. It will take about 1 hour. During the last 15 minutes of smoking baste with the BBQ sauce. One last look-go make them! Anything with bacon has got to be good. I will be making this recipe – maybe this weekend. Can’t wait to eat one of those awesome looking meatballs. These sound amazing….I plan to share this recipe in one of my food columns this summer…giving credit to you of course. =D So happy you shared this interesting concept! This looks absolute delicious – Pity I’ve just come back from the supermarket as we’re having a BBQ tonight. But it’s pinned and I’ll definitely make it! I just finished making these awesome meatballs and it made for a wonderful dinner. OMG!! YUM! Thanks Jen! So glad you like them. They are one of our favorites! Those are extra special YUM! Those look so good. Love me a meatball wrapped in bacon.